The 1980s brought us big hair, acid-wash jeans, questionable TV sitcoms, The Breakfast Club, some of the greatest music ever…and personal computers. The last one is arguably the most significant development of the decade, and it has influenced the way we work and live ever since. These ads from Apple helped to usher in the digital age – of course, they weren’t the only company in the game, but their ads have always been some of the most memorable in the business. 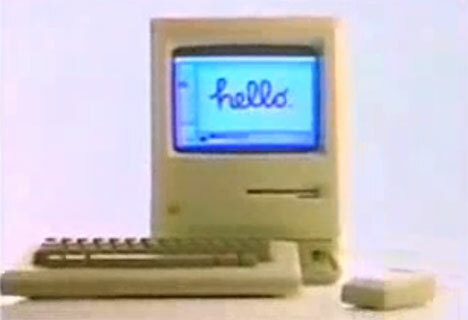 This iconic ad from 1984 helped introduce the world to the Macintosh. It was famously aired just twice: once during the third quarter of Superbowl XVIII and once in Twin Falls, Idaho (for the purposes of qualifying the ad for award ceremonies). The ad, directed by Ridley Scott, is a graphic allusion to George Orwell’s classic novel Nineteen Eighty-Four; the heroine in the commercial is saving the world from the conformity of that “other” computer company (which was IBM at the time). This ad, also from the year 1984, emphasizes the simplicity of using a Mac. The ad makes it clear that you don’t need any special skills to use the “newest, most advanced business computer in the world” – you simply have to know how to point thanks to its cutting-edge accessory: the mouse. See more in Aged Adverts or under Vintage & Retro. January, 2011.